Many ministries and other forums send me their newsletters/information during the course of any given day. Yesterday I received such an information piece. Its contents hammered home that a profound disconnect exists in the minds of mankind brought on by the original sin in the Garden of Eden. Sin disrupted understanding between God and man to such an extent that it took God coming to dwell among humanity as a flesh-and-blood Person to restore the relationship that was torn when Adam disobeyed and brought sin and death into the world. When Jesus came into the coasts of Caesarea Philippi, he asked his disciples, saying, Whom do men say that I the Son of man am? And they said, Some say that thou art John the Baptist: some, Elias; and others, Jeremias, or one of the prophets. He saith unto them, But whom say ye that I am? And Simon Peter answered and said, Thou art the Christ, the Son of the living God. And Jesus answered and said unto him, Blessed art thou, Simon Barjona: for flesh and blood hath not revealed it unto thee, but my Father which is in heaven. And I say also unto thee, That thou art Peter, and upon this rock I will build my church; and the gates of hell shall not prevail against it (Matthew 16:12-18). 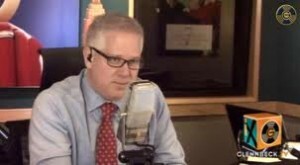 Today I was listening to Glenn Beck as he chatted with his radio partner and his audience. I’ve listened many times to the famous Mormon talk-show host use the name of Jesus to claim his being a Christian. I’ve recently covered the points of difference between what God’s Word says about Jesus and Mormonism’s view of Jesus. In brief, that cult holds Jesus to be the created brother of Lucifer. Yes, the same Lucifer (the serpent) who brought about the disconnect between God and man through seducing Eve and tempting Adam to disobey God. Mr. Beck was intimating how Jesus had no interest in “rapturing” His “people” from this world; rather, He wants His people to make this world a wonderful place of freedom - a heaven on earth. That is Mormonism. The Mormon Church will be the final authority in any such new world order, according to its eschatology. Beck, in his usual way, became increasingly sarcastic and chiding while he mocked the Rapture. He talked about how if the rapturists wanted to really make a statement, they should, rather than set dates for the Rapture, simply state that they are leaving, go to some spot, and let their clothes drop to the ground as if they had been taken. Then they should stay out of the picture so the world would perceive they were gone. Thus, Beck implied slyly that those who believe in such nonsense would get out of the way so real religionists - the Mormons - could bring about Utopia. “Knowing this first, that there shall come in the last days scoffers, walking after their own lusts, And saying, Where is the promise of his coming? for since the fathers fell asleep, all things continue as they were from the beginning of the creation" (2 Peter 3:3-4). “Let not your heart be troubled: ye believe in God, believe also in me. In my Father's house are many mansions: if it were not so, I would have told you. I go to prepare a place for you. And if I go and prepare a place for you, I will come again, and receive you unto myself; that where I am, there ye may be also” (John 14:1-3). Jesus said, “The Son of man is come to seek and to save that which was lost” (Luke 19:10). Jesus asks you, “Who do you say that I am?” How you answer this most important question of history will determine whether you go to heaven or to hell for all of eternity. Answer wisely.